Pressure washing or power washing is an extremely useful way that can be used to transform your home from a dusty place to a magnificent palace. Water under high pressures, typically in the range of 750 to 30,000 PSI, is used to wash away paint, grime, dust, dirt, mold, and even chewing gums from hard surfaces. Pressure washers can also come with a variety of nozzles with various patterns of spraying. These nozzles can accommodate and spray soap water or other formulations. When you have a pressure washer at home you don’t need to worry about having dirty vinyl fences, exterior parts of your home, garage door, slimy grills or patios. You can also use these machines to get rid of cobwebs or other annoying bug nests, but before you do that make sure you use bug spray! Driveways, cars, motorbikes, bicycles, and other equipment are usually washed once a year and kept clean – thanks to your top-notch pressure washer. What if your pressure washer suddenly gets wrecked? No need to panic – we’ve provided a list of the most common problems associated with pressure washing and what you can do to get it going again. Pressure Washer Not Starting? Even If It Starts, Does It Suddenly Stop? Your pressure washer may refuse to start for a number of reasons. The spark plug electrodes might get weary and damaged so replacing the spark plug is an option. Also, check if the carburetor is clogged. It might get clogged if fuel is stuck in the carburetor for a long period of time. Clean the carburetor and still if it doesn’t work, do replace it. Ignition coil starts the engine, so check if the ignition coil is defective. Before replacing the coil again check if the spark plug is working. If it is, then continue to replace the coil. When a pressure washer hits an object hard, the flywheel key gets sheared in half to protect the engine. If flywheel key is sheared you have to replace it. If your pressure washer turns on but then suddenly stops, you might need to check whether the fuel filter is clogged. If there is any remaining old fuel in the pressure washer, drain the fuel away and replace the filter. Try to loosen the fuel cap a bit. Fuel cap prevents the pressure in the fuel tank from exceeding the pressure in the engine. By loosening the fuel cap, air would enter the tank which could lower its pressure and get the engine running again. If that still does not happen, consider replacing fuel cap. Check air filter and pre-cleaner maybe clogged but these happen very rarely. If it does happen, you should replace them. Spark arrestor prevents the engine from creating sparks. It could get clogged as well. If it does, clean it with a wire brush. A faulty hose or broken nozzle could be why the pressure washer is not spraying water out. Remove the nozzle to check for any blockage and then reinstall it if no blockage is found. You need to be familiar with different types of nozzle to identify which type yours belongs to. Check hose and trigger gun blockage too and replace if these are broken. Pressure Washer with No Pressure? If your pressure washer is not producing the right amount of pressure the most likely cause would be a defect in the pump. Replacing pressure washer pump is the only option in that case, especially if the pump is a few years old. However, if the pump is relatively new then try replacing the pump seals or rebuilding the pump assembly. 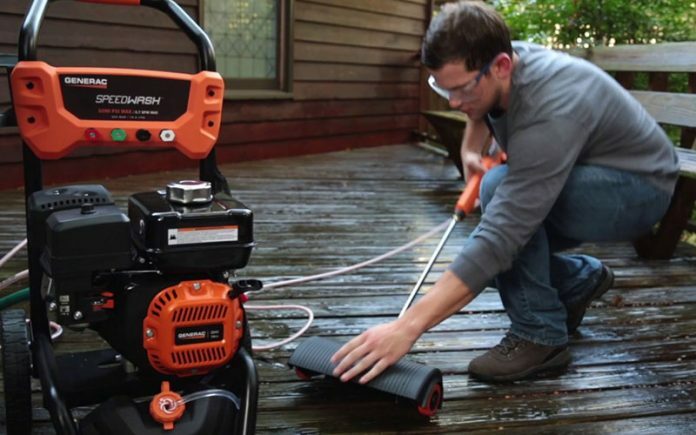 Want Your Pressure Washer to Run Smooth? If your pressure washer is not running efficiently, you should check whether the carburetor and fuel filter are clogged or not. Try to clean those parts. If these parts contain way too much old fuel that cannot be cleaned out then you should replace both. Are You Panicking Because Your Pressure Washer Is Leaking Water? You might need to consider pressure washer repair if your pressure washer is leaking water. You should check whether the thermal release valve is properly working or not. Since water is under high pressure it could also gain a temperature increase. The thermal release valve normally pushes some water out if the water temperature becomes extremely high. This could happen if you leave your pressure washer on and it is not spraying out water. Upon reaching a temperature limit the valve will allow the release of some of the hot water, which you can think of as a leak. This happens normally so it is nothing to worry about, but you should not leave the washer on while it is not spraying. If you see that the thermal release valve is working fine, you can consider replacing pressure washer pump and pump assembly, but only if these are a few years old. Otherwise, it’s better to repair and rebuild the pump. The pressure washer might not produce soapy water when you want. That would mean inefficient cleaning. In this case, there is no other option but to replace the chemical injection kit. The names of these parts may be confusing you. The trick is to understand that a pressure washer has three basic parts- a pump, a hose, and a trigger gun. There are additional parts associated with these basic parts. Always seek professional help regarding these additional parts and routinely check if your pressure washer needs cleaning and maintenance. The parts usually vary with models so you will need to look at the manual the pressure washer comes with. Most people throw the owner’s manual away. It is quite useful. The manual usually has all the parts labeled, so if any one part is damaged you would know exactly what to repair or replace. You should even read the manufacturer’s guidelines to know more information about how your pressure washer works. Pressure washers usually run on gasoline and might make a lot of noise. You also might see oil leaking. The noise or vibrations could come from broken connecting rods and bearings. Usually replacing the pump can fix the noise issues. Release the trigger to ensure that no air is trapped inside the pump could also help. Just ensure your pressure washer is well lubricated with oil to reduce the noise and make sure to use oil recommended by the manufacturer. Using another kind of oil could corrode the pressure washer and cause unnecessary leaking. Replace any seals and damaged o-rings, if you see an oil leak even after using the right fuel. The pressure washer is an invaluable machine that helps you keep your home free of tough grime all year round, without having to use much manual labor. It can reach corners where you cannot, it can clean surfaces where you might as well not reach. For showing off the new paint or new decorations of your home and yard, you will definitely need a pressure washer to make your home look spotless. The right method of pressure washer usage prevents your home to look young and free from harmful substances or insects that could cause serious health concerns. It gets rid of organisms capable of causing disease in your pets and loved ones. Regular maintenance and cleaning will allow your pressure washer to assist you in your vision of a clean and healthy family for years.